Too often, when we who dwell in the world of planning address those who know little or nothing about our line of work, our jargon – what I call “plannerisms” -– can prevent understanding and promote confusion. Sometimes the message received (if any) bears little resemblance to the message delivered. The complexity and nuances of planning are challenge enough for our audiences to understand without raising another hurdle in the form of plannerisms. 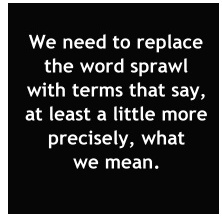 If planners were to delete only one word from their vocabulary, I’d vote for “sprawl.” True, it’s not jargon in the sense of being of obscure meaning to most people. Rather, it’s a plannerism because it’s been rendered meaningless by having too many meanings. A community activist in my town, whose exurban mini-mansion is situated in the middle of her 20-acre ranchette, regularly condemns sprawl, which to her is exurban development with any density exceeding one home per acre. 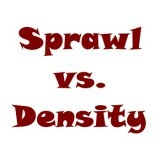 We planners need to replace the word sprawl with terms that say, at least a little more precisely, what we mean. Sometimes we can substitute a density ratio, other times a median square footage of residences. On occasion the sprawl of which we speak may be single-story and/or single-use development -– so we should use those more specific terms. I used the word “density” above –- which many planners regard as a plannerism due to its growing perception as a pejorative. Many people appear to regard the word as synonymous with “tenement,” as intentionally promoted by professional denigrators of compact and mixed-use development. Dave Stauffer continues with a look at smart growth, along with a sampling of several other plannerisms.